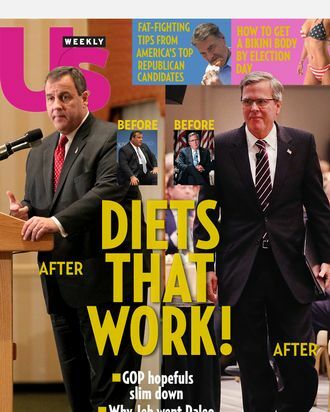 As Republicans gear up to jockey for the 2016 presidential nomination, several potential candidates have embarked on diet and exercise regimens apparently meant to prepare them for the “physical rigor” of the campaign trail. New Jersey governor Chris Christie and Florida governor Jeb Bush have both appeared noticeably slimmer in recent months, and former Arkansas governor Mike Huckabee has long profited from the dieting industry. Here’s how six GOP presidential hopefuls are preparing their bodies for the presidency. As Us Weekly might say: It is the White House, not White Castle. The current governor of Florida told Politico on Wednesday that in late 2014 he began following the Paleo diet in order to “slim down.” Based largely on pseudoscience, the diet requires that you eat only foods that were available to our cavemen ancestors. The bulk of meals consist of lean meats, berries, and nuts; you may not eat dairy, refined sugars, salt, grains, or anything else that has ever adequately satisfied your hunger. “I’m not nearly as interested in food as I used to be. But that hasn’t all of a sudden made me a huge vegetable fan,” he told People in 2013. In 2014, experts estimated that Christie had dropped 85 pounds, and he’s only getting thinner. Maybe it was the 77 diet books he received as gifts that kicked him into gear. 3. STOP Sitting on the Couch. 4. STOP Ignoring Signals from Your Body. 5. STOP Listening to Destructive Criticism. 6. STOP Expecting Immediate Success. 9. STOP Storing Provisions for Failure. 10. STOP Fueling with Contaminated Food. 11. STOP Allowing Food to Be A Reward. 12. STOP Neglecting Your Spiritual Health. According to Men’s Health, the method helped Huckabee shed 110 pounds in 15 months, allowing him to eschew the seat-belt extender and “climb the capitol steps without becoming drenched with sweat.” Huckabee admitted in 2009 that he regained at least 30 pounds, partly as a result of a knee injury that kept him from running, and he appears to have put on several more pounds since. Seems like it’d be hard to stick to, but if you’re getting sick of green eggs and ham, it might be worth the effort. Unlike the other candidates on this list, Louisiana governor Bobby Jindal is trying to put on weight instead of lose it. According to the National Review, he’d gained 13 pounds back in October 2014, and “with the 2016 election on the horizon, he is looking to beef up.” Might we suggest eating the cake Governor Bush won’t touch?